This weekend (January 26 to 28), earn free raffle tickets when you play four designated real-money online slots from Betsoft at Intertops Poker and Juicy Stakes Casino. You'll get one free raffle ticket for every 10 spins with a wager of $.60 or more. Winners will be randomly drawn and receive a total of $1000 in raffle prizes. First prize is $400. 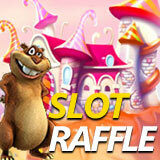 Intertops Poker and Juicy Stakes Casino players earn free raffle tickets playing Betsoft slots. The four featured slots from Betsoft, a casino games developer known for brilliant graphics and innovative features, are: Sugar Pop, Gold Digger, Heist and Mega Glam Life. Sugar Pop’s popping candies blow up to reveal new symbols that can give additional winning combinations. With every winning spin, players advance to higher game levels and higher payouts. Additional high value Power Candies unlock as they progress through the levels. Gold Diggers takes players to the Wild West for action packed adventure. Exploding Dynamite symbols cause symbols above them to fall and create new chances at winning combinations. Three or more Gopher symbols trigger a bonus feature where players click symbols to dig instant bonus credits. Heist features a professional heist man on the verge of the biggest score of his life. Players help him crack the safe in the heart-pounding bonus round. The special C4 symbol can cause the middle reel to explode revealing a 2X Wild reel. Mega Glam Life has some of the finer things in life, like fast cars, private jets and lots of glittering diamonds, spinning on its reels. Hitting three Bonus symbols starts the Money Wheel Bonus Round. Players spin the Money Wheel to win instant prizes that include three progressive jackpots. These games are all listed under the Betsoft tab within the poker software.